Police were searching for an object that the suspects may have tossed from their vehicle, sources said. Two men have been accused of shooting a retired Westchester cop Monday afternoon after he interrupted a burglary in progress, officials said. Taqiy Walton, 34, and Adam Larregue, 20, both face attempted murder charges after former Greenburgh officer Peter Schmidt was shot and wounded while walking in the town on Monday. Schmidt, who retired from the force 10 years ago, was shot after confronting two men seen leaving a home on Payne Street, officials say. Schmidt, who knew the home was vacant, had a brief conversation with the men before being shot in the arm and body, officials say. Schmidt's son, an off-duty Greenburgh officer, heard the shots and ran to the scene and was able to catch the license plate of the blue BMW the suspects fled in and call it in to police, officials said. A retired police officer police was shot twice in Westchester County Monday afternoon after the cop interrupted a burglary in progress. Police say the officer's son, also a cop, was able to help nab the suspects. Checkey Beckford reports. 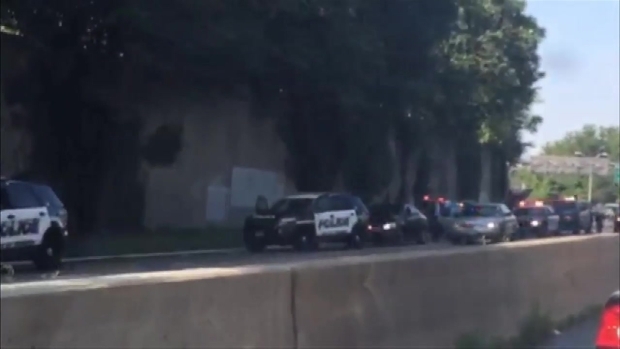 Minutes later, Walton and Larregue were apprehended by Yonkers police on the Sprain Brook Parkway near the Cross County Parkway, McNerney said. Authorities were searching the roads for an object the suspects may have tossed out the window, sources said. Schmidt was taken to the hospital after the shooting but has since been discharged. Attorney information for Walton and Larregue wasn't immediately available.